April 17, 2013: John Strausbaugh discusses his new book The Village: 400 Years of Beats and Bohemians, Radicals and Rogues, a History of Greenwich Village. In the 1950s one could still drive one's automobile through that arch and into the park. Oh, is today the Strausbaugh session? Dang, and me with a heavy workload. This may be a job for The Archives. 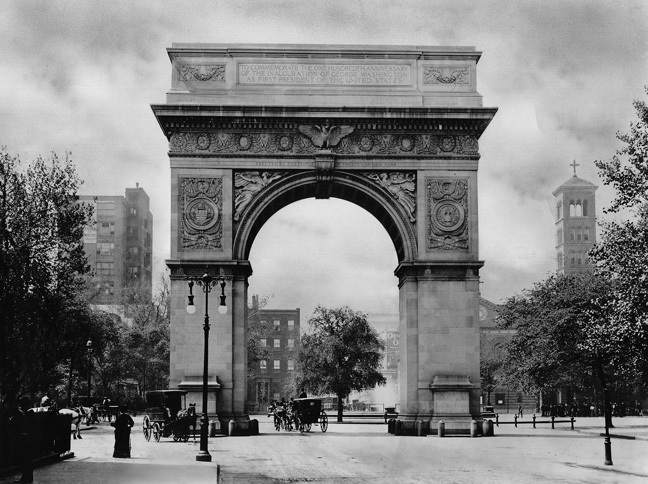 "the arch wasn't fully complete when it was unveiled: the two statue bases on the Fifth Avenue side of the arch were conspicuously empty and would remain that way until 1915-17 when the two statues of Washington were finally erected"
- & the scope & detail of the work discussed look so impressive ! – I know I’m going to learn a lot that’s very interesting! - Suze Rotolo was Dylan’s girlfriend in early 60’s - & just read her recent (2008) book centered around the Village: "A Freewheelin' Time"
- & even more tangentially (but hopefully appropriate enuff to scope of Mr. Strausbaugh’s work to mention) I’m reminded of 'Birth of the Cool’ by Lewis MacAdams. i'll play those instruments. have someone get in touch. Agree Alison - this Partch is great. Thanks Irwin. What was his date of death, and is there a published source for that? It's not on his wiki page, nor on his personal webpage (where his bio is in present tense), as linked to off his faculty site. - & beautifully played - by Mr. Drummond (& a few others)? If anyone can find a death citation online, please add it to DD's wiki page. I've heard it from multiple reliable sources, but have yet to come across an obit. The NYT apparently has one ready to go, but they have yet to find space for it. - both experimentally Moderne & really lovely. What a treat. What's that drumming stuff? Gamelan?? I missed the spoken information..
yea, revolution. me too. this is great! Haven't heard "Then or Never" or "Daphne of the Dunes". Enlightening..., I thought I heard most Partch, and by extension, Drummond pieces. Joining what everyone else is saying; this is wonderful. cholera ... and herds of pigs running amok in the streets of lower Manhattan. Jon Savage's "Teenage" touches on Greenwich Village from the late 1850s-1960s. And now we sneer virtually. Progress. Ah, so *this* is "Rose of Washington Square"! I've heard of this song all my life and yet never heard it before. he wrote a great short story about beer. John's website doesn't seem to have any way to sign on to a newsletter or other e-mail notices. Just thought I'd mention it. I am so loving this interview. Such a great interview, Irwin! This is a great and underplayed album. I love this music!!! It sounds like a black and white cartoon. Not a Bonzo original - ?!?! Irwin, what's the name of that website with the historical writing on it? I suspect I heard it wrong, because any spelling I've tried is not coming up with results. This is an apt Bonzo cover. Can I believe what I'm seeing? This Bonzos tribute album has "I Love to Bumpity Bump" performed by Guy Lombardo and His Royal Canadians? "Jollity Farm" was also done in German by the Comedian Harmonists. Called "Heut' fahr' ich mit Dir in die Natur"
Why is Bryce always skipped as one of the FMU Drum Corps? Droll, Bryce drums in several numbers each year for the Hoof 'n' Mouth, and did so this year, including his flawless rendering of the drum kick-off to "We're An American Band". Flip side of "Paperback Writer". Both good songs if you like that sort of thing. Which I do. What? It's almost 18:00? Where does the time go? Not sure what's for dinner. I'd better check.